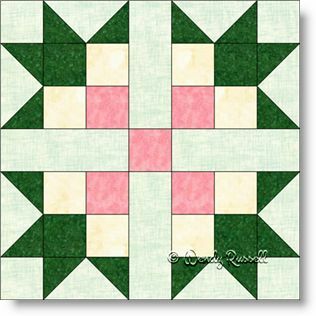 The Magnolia quilt block is a seven patch that I have modified slightly to remove many (unnecessary) seams. This makes the sewing easier and creates less bulk -- a winning combination. Even though this block is a seven patch, I find it much easier to construct it as an uneven nine patch, rather than sewing it together in seven separate rows. I replaced many of the half square triangle patches with flying geese units so that there is no centre seam in those patches. The remaining patches are simple squares or rectangles. The two sample quilts show common block settings by placing the blocks side by side or on point, and both quilts use sashing strips between the blocks. All in all, these are lovely springtime designs -- just like those beautiful magnolia trees!